The notion of public space as an open and accessible spatial common in which people gather and meet one another is presently called into question. New media and algorithmic, data-centric urbanism present challenges to physical spaces meant for public encounters. The privatization and commodification of public spaces complicate the dynamics of access. In addition, the social character of space changes due to the increased movement and migration of people, cultures, technologies, and products. These conditions present new challenges in encountering and understanding otherness within the limits of local space. 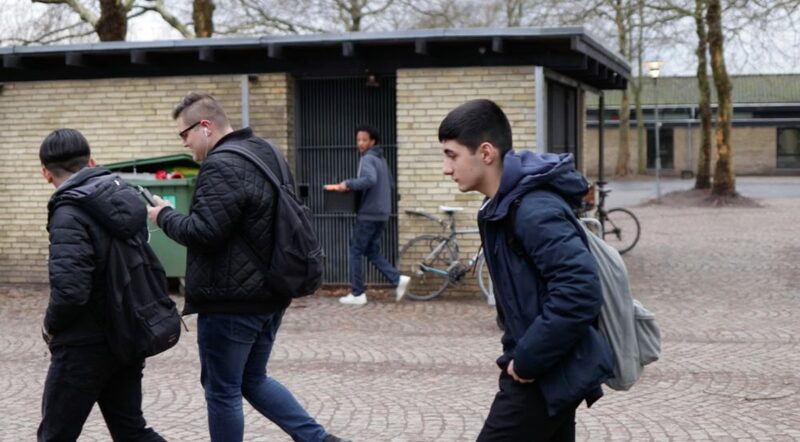 The following is an account of the cross-disciplinary methods of filmmaking, research, and participatory processes experienced in the making of When Strangers Move In, a short film which investigates the complex social dynamics between long-term residents of the Danish town of Hørsholm and the Eritrean refugee groups taking up temporary asylum in the town. 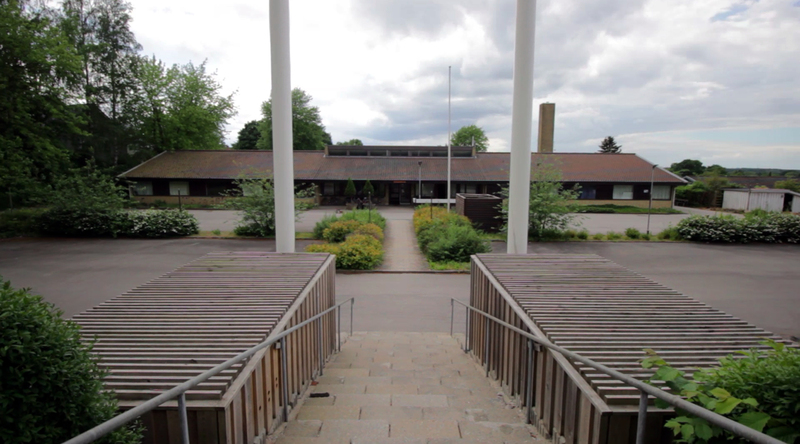 The character of Hørsholm, an affluent residential area, is described in the film through the use of elements expressing reticence, politeness, privacy, and tidiness. These devices reflect the cultural qualities of the quiet Danish neighborhood of peaceful homeowners. The exchanges between the Eritrean community, based in an out-of-use retirement home called Hannebjerg (Figs. 1, 2, 3), and the surrounding neighborhood remain minimal, creating an environment where the understanding of another culture is based largely on imagination and preconceptions. The arrival of the refugees is primarily discussed as the arrival of a culture which differs significantly from local norms, and one that is likely to disrupt the neighborhood (Fig. 4). The refugee is thus generally understood as a destabilizing force to everyday life and culture of the local neighborhood. 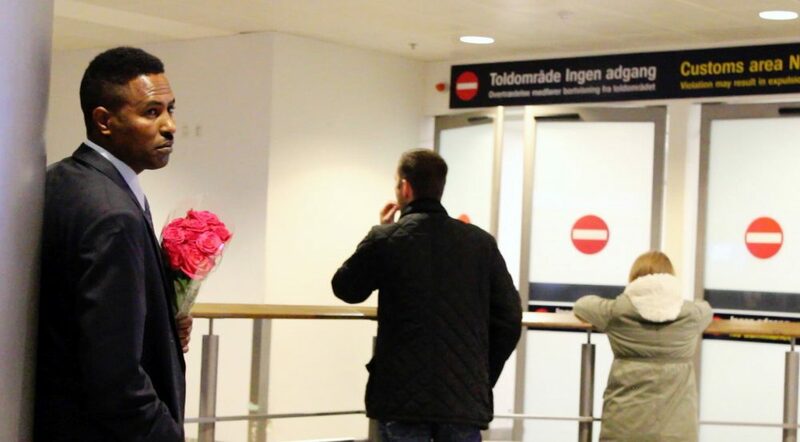 The Eritrean community, on the other hand, articulates the desire to exchange cultural views and customs and participate in Danish society, but finds it difficult to locate or create such social platforms. Figure 1. The film production office was set up in one of the unused rooms of the Eritrean community’s temporary lodging. The wall sign Selam Selam is written in Tigrynia and translates as Hello Hello. Figure 2. The temporary home of the Eritrean community in Hannebjerg as seen from the street. The out-of-use retirement home was used as municipal temporary refugee housing for two years, through August 2017. It is currently under redevelopment and will turn into residential units. Figure 3. Passing a neighboring house. Figure 4. 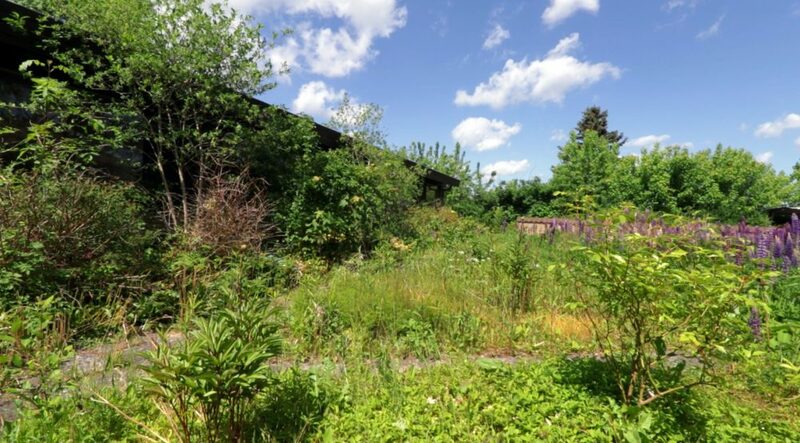 Parts of the building can be observed as unused and unmaintained. Wild vegetation seen from the back of Hannebjerg. It is the deterioration of the former retirement home that sets the refugee shelter apart from other homes in neighborhood. As part of this project, a film production office was established within the Eritrean community’s temporary lodging. We utilized the medium of film to foster collaboration and understanding between the different cultures. 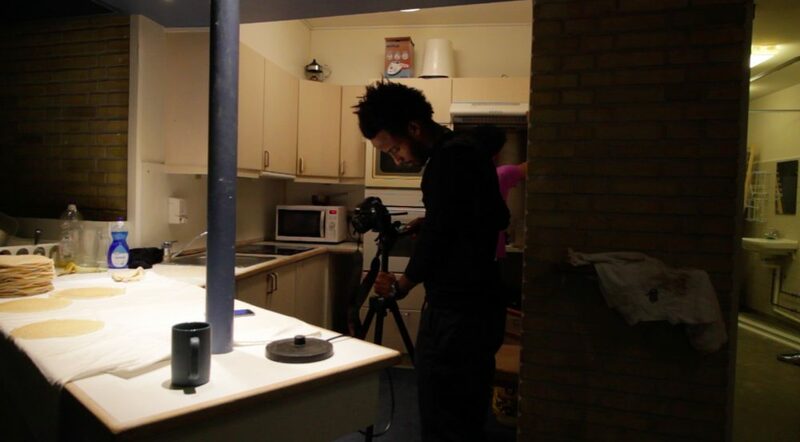 Designing and employing methods related to social art practices and visual ethnography, our filmmaking allowed us to reveal, represent, reenact, and share moments of life and culture of the Eritrean community in the context of the local Danish society. These methods facilitated social and aesthetic experimentation and, furthermore, gave form to the nomadic narration of the film When Strangers Move In. The establishment of our film production office within the refugee community was a departure from the general norms of the neighborhood. The intimate setting enabled valuable cultural exchanges and allowed us to explore the repetitive actions of everyday life and work within the community, providing insights into cultural relationships while offering rich opportunities for the production of new images. The office offered a new space of creation and experimentation that went beyond the final film product. The film was outlived by personal and social experiences and exchanges. Hannebjerg became a place of decoding and learning about new cultures; a place where discussions and daily exchanges of cultural practice became a way to engage with, understand, and participate in Danish society and culture. Discussions relating to work-life, music, love, traditions, municipal integration programs, neighborhood life, sports, Danish language, and film provided points of departure for the making of a new local expression. These activities also demystified cultural differences (Fig. 5). Figure 5. Filming everyday scenes. 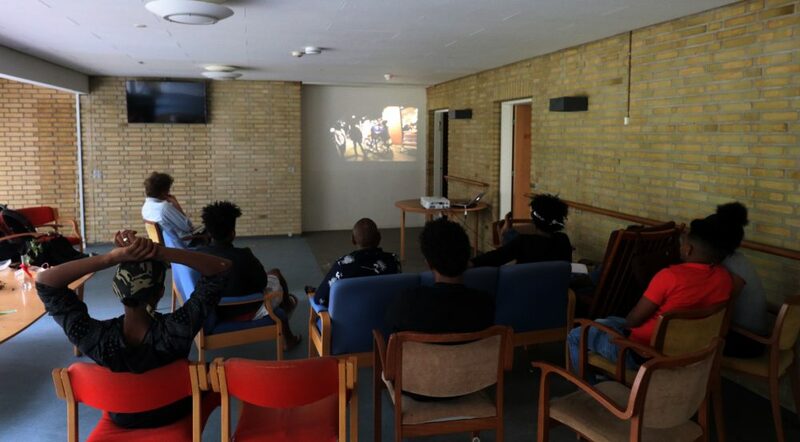 By applying a methodological approach of open-ended social experimentation and working actively with these concepts, the project allowed a shift in the perceptions towards the Eritrean community in the Hørsholm neighborhood. It created a situation that integrated with the refugees’ longing for new forms of cultural expression. In this process, the everyday life and subjective becoming of the refugee contributed to the local cultural production and acted as a new form of dialogue in the context of neighbors’ preconceived notions of otherness (Fig. 6). Figure 6. Discussing themes and narration of a preliminary edit of the film. The described participatory methodology resulted in a 25-minute-long film, When Strangers Move In. The title could very well refer to the act of two artists moving into the home of the Eritrean community, but it also works to frame the film as a contemplation on how life is shaped in an unknown environment, within an unfamiliar society. The film highlights the small expressions of everyday life, and is concerned with the notion of becoming a social being in a new place and in between places. The film centers on the figure of the refugee not only as a figure of escape, but as a figure in-between escape, arrival, and returning. A figure that stretches in-between his/her past, present, and future to become a new version of themselves within a new society and in-between places that are not home. The central element of the film is the employment of nomadic narration. The storytelling unfolds without a clear course or a linear storyline. It does not connect any of the events or people that appear on screen and unfolds without a clear beginning, middle, or end. It is, instead, a mosaic of moments. The nomadic scenes are accompanied by a Tigrinya voiceover narration that observes and describes several unfolding situations—a wedding, family reunion, homemaking, work, etc. (Figs. 7, 8, 9, 10). The voiceover reflects on concrete and abstract perspectives of the Eritrean people, inviting a meditation on both the various facets of everyday life and the wishes and desires of the refugees. The narration of the film does not focus on the figure of the refugee as fugitive, but rather on the refugee’s arrival and the urge to connect. In this sense, the narration can possibly help demystify or even recast the way we understand categories such as refugee or stranger. The film seeks to address the false impressions of the refugee as a representative of a culture with the potential to destabilize local, everyday life. Instead, it offers an opportunity to shape new ideas based on the perception of the refugee as a force capable of creating positive and meaningful relationships within a new social environment. Figure 7. Working as a cleaner in a nearby school during closing hours. Figure 8. A family reunion at the airport. Figure 9. 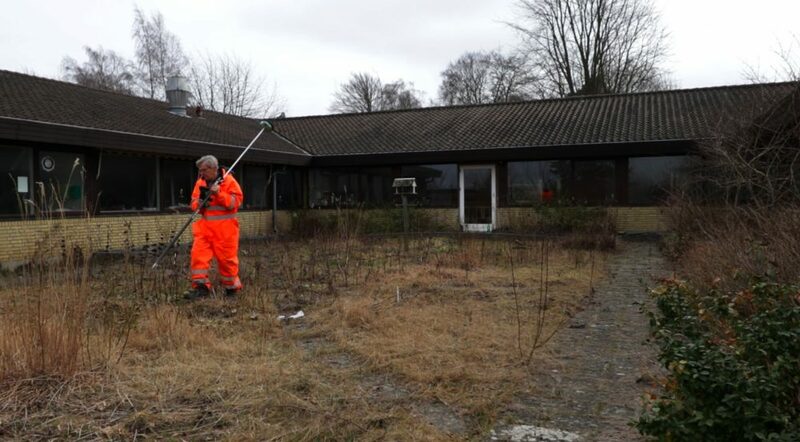 Surveyor taking measurement of the plot for future development. Figure 10. 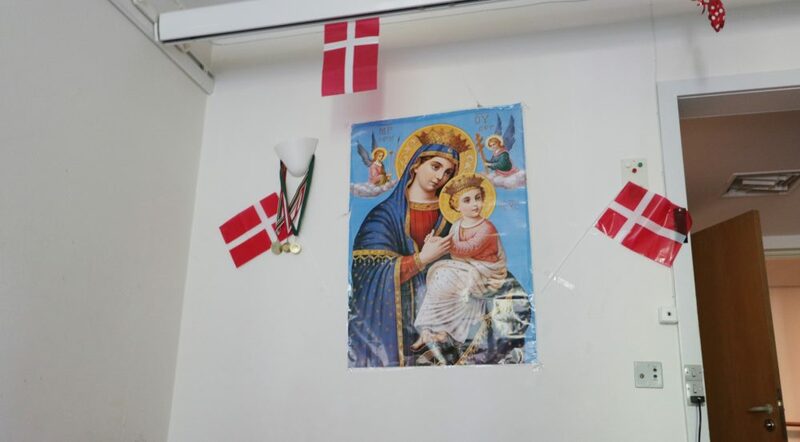 A hoist in the ceiling and decoration in the home: a religious poster, Danish flags, and football medals. All images are screenshots from When Strangers Move In, 2017, courtesy of Jamboy. Jamboy is an art and research collective consisting of Lasse Mouritzen and Peter Kærgaard Andersen.